The process of a marriage took a definite form of order. This was brought about either by the mutual consent of the young people involved, by the instigation of the parents, or the use of a matchmaker. It appeared that the first two situations were more common in Norka. 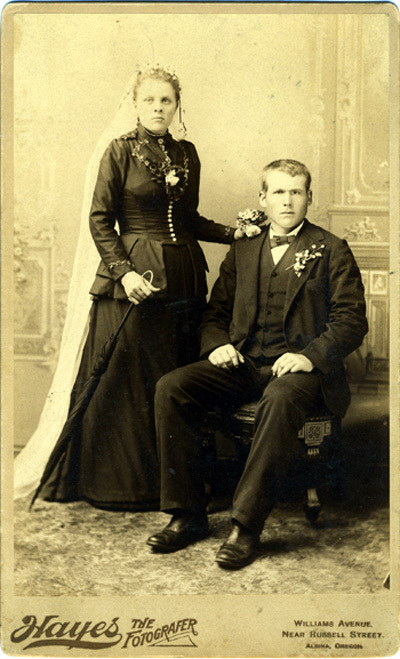 Wedding photograph of a Volga German couple in the Albina district from the early 1900's. Written on the back of the photo is "This picture is Elizabeth Bauer". This photograph courtesy of Stacy Hahn. ​A young man wishing to marry would first receive permission from his family. He needed their approval of the young girl he had chosen for his wife and also of her family. Of course, this would be no problem if the young man's parents were arranging this union. After receiving his family's blessing a group would make a visit to the young girl's home to ask her parents for their daughter's hand in marriage. This group consisted of the young man, his father and godfathers who play a big part in their god-son's wedding. There was no doubt an air of courtesy with the father doing most of the talking. He would expound on the merits of his son and what a wonderful wife their daughter would be. The girl would be presented a gift that was brought from the young man's mother. If the girl's parents consented there was much hand-shaking and gaiety which called for drinks and refreshments. Sometimes the girl's family would not readily accept and another visit would be required. The German term in referring to a couple to be married was Sie sind gefreit. This is comparable to the English term "They are engaged." A man who took part in these wedding activities was called a Gefreiersmann. At this time the date of the wedding would be set which was generally in the winter because more time was available to make the preparations. No marriages were performed during the Lenten season. Spring followed with warmer weather which meant the resumption of work in the fields. Weddings were also observed during the week so that the celebration did not extend into the Sabbath. Shortly after the agreement of marriage a dinner was attended by, the families. This added to the festivity and was referred to as a Wunghoff. Three consecutive Sundays before the wedding date announcements of the impending marriage were made at the church services. This gave anybody a chance to speak out against this union to take place. Ich bring eich einen schönen Grüss Von Braut and Brautigam. Sie lassen euch bitten insgemein Ihr sollt auch Hochzeitsgaste sein. Bis den kommenden Dienstag ist das Fest So stellt euch ein ihr lieben Ggst. Steckt ouch Messer and Gabeln ein Es wird was zum verschneiden sein. Ein Altos Schaf and eine Lahme Kuh Die kommen ganz gewiss dazu. Ein Schwein ist plötzlich umgekommen Das wind gewiss dazu genommen. Und sieben Hühner and ein Hahn Müssen alle auf einmal dran. Ddse alle sind so fett Wie ein gedörtes Wagenbrett. Unsere Ves Analies Sie backt die Kuchen Sauer and süss. Das . kann man, glauben fir gewiss. Sie backt sie ja nach ihrer Art Sie macht sie vie ein Wagenrad. Sie hat rote Haaren and Sommerflecken Das Essen wird vortrifflich schmecken. Es sind auch Musikanten da Die spielen Hopsa Trallalla. Mit Pfeifen, Geigen and Dudelsack Da kann man tanzen nach dem Takt. Mein Stöchchen bitt um ein Band So mach ich euch noch mehr bekannt. Blitz: Kreutz! Es fällt mir noch was sin Ich schweig ganz still vom Brantewein. Im Keller liegt ein Fass mit Bier Es krissellt mich ja selbst dafür. Selbst gesehen hab ich's nicht Ein bischen lügen schadt such nichts. Ei da drausen fliegt ein Spatz Gebt dem Hochzeitsleider einen Schnapps. ​I bring you a nice greeting from the bride and groom. They both request that you should be wedding guests. This coming Tuesday is the celebration so set forth dear guests. Bring along your knives' and forks there will be something to eat. An old sheep and a lame cow will certainly be there. A pig has suddenly been butchered which will certainly be taken. And seven hens and a rooster must all at one time be next. These are all so fat like a dried up wagonboard. Our Aunt Alice she bakes the cakes sour and sweet. That one can believe. She bakes them in her own way she bakes them like a wagon wheel. She has red hair and freckles the food will taste awfully good. There will also be musicians who play "Hopsasa Trallalla". With pines, violins and bagpipes there one can dance with the time. On my cane tie a ribbon to make it known to you. "Blitz!" "Kreutz!" I have forgotten something else I'll keep entirely quiet from the brandy. In the cellar is a keg of beer I am attracted to it: I haven't seen it myself , but a little lying doesn't make any difference. Outside flies a sparrow give the wedding inviter a shot of whiskey. 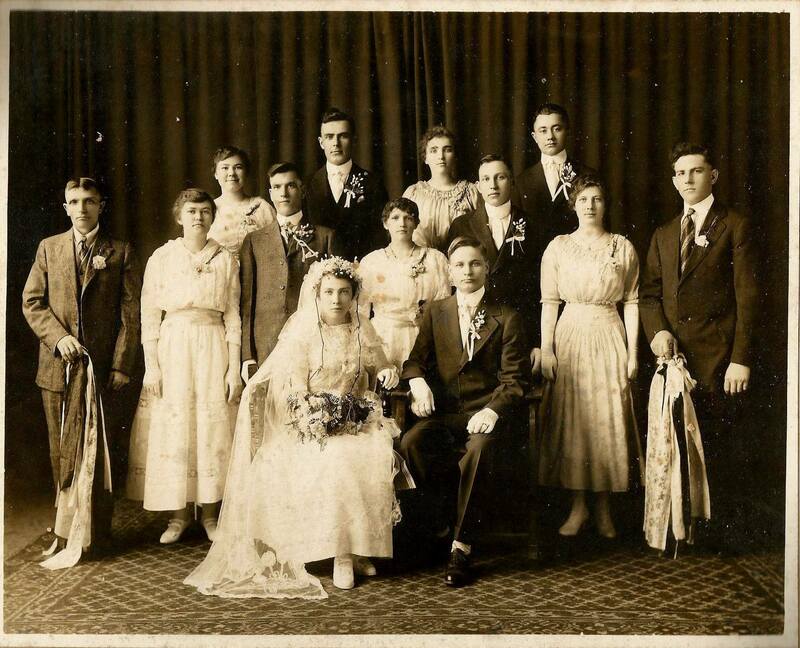 This 1917 wedding photograph of Emily Kaiser and Christ Hicks shows two men (at the far left and right) holding canes tied with ribbons acknowledging the acceptance of wedding invitations. Courtesy of Scott Lewandoske, Sheboygan, Wisconsin. ​When a household accepted the invitation they, as indicated in the poem, acknowledged by tying an additional ribbon to the canes. These ribbons or sashes could be very elaborate and you can imagine how decorative this would be. Drinks were served by the household to celebrate the upcoming wedding. After making several house calls the invitation delegation could go no further and as a result took this took several evenings to perform their task. Another social function that took place was a dance for the younger people on the day before the wedding. This could be described as a last "fling" for the young with their friends. On the morning of the big day the groom, his godfathers and best men went to the bride's home to take her to church to be married. They called to her to come out of the house. There was much excitement and joy both outside and inside where the bride and her friends were getting prepared. To tease the groom one of the bridesmaids instead would open the door and come out. The groom and his friends would express disapproval and keep calling for the bride. You can imagine their reaction whenever an old maid aunt appeared at the door. There was a procession to the church of the wedding party. At times they were accompanied by musicians or they might ride in decorated horse-drawn sleighs. You visualize a German-Russian wedding with snow because it was winter in Russia. The bride, as in present times, wore a white gown and a veil which perhaps was not as long. The groom wore in his lapel a large flower from which hung a long sash or ribbon. The male members of the party had bands of ribbons and little flowers around their arms and hats. Generally the couple was escorted by two bridesmaids and two best men. 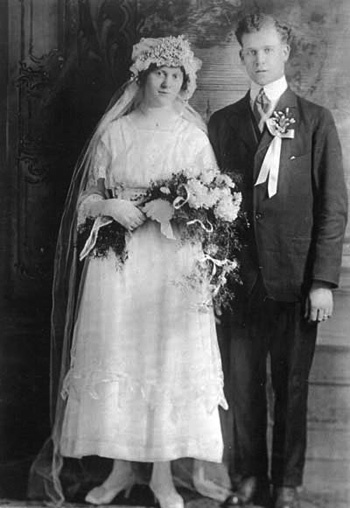 Photograph of Henry Glanz (son of Jacob and Dorothy Reitz) and Marie Henkel (daughter of John and Alice Block) on their wedding day, March 18, 1918, at St. Paul's Church in Portland. Henry is wearing a white wedding ribbon. It was traditional to have a reception after the wedding which included great food, drink, and dancing. The dancing began with a wedding march led by the attendants followed by the bride and groom, family, and friends. Once the march had been concluded the bride and groom danced. A person would cut in by tapping the groom on the shoulder indicated he wanted to dance with the bride. He would pin money on her bridal dress before dancing with her. Women would pin money on the groom's lapel ribbon. Photograph courtesy of Nancy Cooper, Kathy Hoffee and John Killian. Several couples could be getting married at one service. The wedding parties marched down the aisle with the couples sitting on the front benches. A sermon was first given by the pastor after which they came forward for the ceremony itself. As a note of interest the groom placed the ring on the middle finger of the brides right hand and there were no double ring ceremonies. The wedding reception was held at the home of the groom's family. In the procession from the church there was much festivity and male friends would go as far as to fire guns into the air. Upon arriving at the home a receiving line was formed outside with the invited guests extending their blessings and best wishes. The groom's mother at this point would come out of the house and welcome her new daughter-in-law to her new home. The bride was now a member in the household of her husband's family. The festivities would begin with brothers of the church singing and saying a prayer. This was then followed with dancing and other social activities. A wedding consisting of much dancing and musicians was referred to as a tanz-hochzeit (dance wedding) and one with a more religious aspect would be a Brüder-hochzeit (Brethren wedding). The celebration would last for two or three days with guests coming and going. Two meals a day were served consisting of roast, dumplings, schnitzsuppe (dried fruit soup) and other dishes and breads. In Russia there was a great variety of drinks from potato schnapps to fine grape wine. There was a punch served consisting of hot tea and cognac which had a great effect on the participants. All gifts to the newlyweds were in the form of money. An exception was a beautiful pillow or two made by the bride's godmother. This was passed around to the guests who placed upon it. When any man danced with the bride he pinned money her. Coin money was placed in the drinks served to her. Another activity was to auction off the brides wedding shoe. This would at one time be stolen from her and then reappear - being displayed on a pillow with much ceremony. A best man was generally expected to be the highest bidder. The amount of lavishness of a wedding was governed by the means of the families and other economic conditions prevailing at the time. This was the greatest social event in their lives and they spent as much time and money as they could afford. It was shared by the families of both the bride and groom. So much work was involved in preparing the food that the mothers of the couple and other women relatives and friends were too busy to attend the marriage service at the church. After the wedding the new wife would assume the duties as that of the other woman in her home. A cow and a sheep were brought along as her dowry. She would now live happily there-after with her new husband, his father and mother, his brothers and their wives, his nephews and nieces, his grandfather and grandmother - and maybe some aunts and uncles. 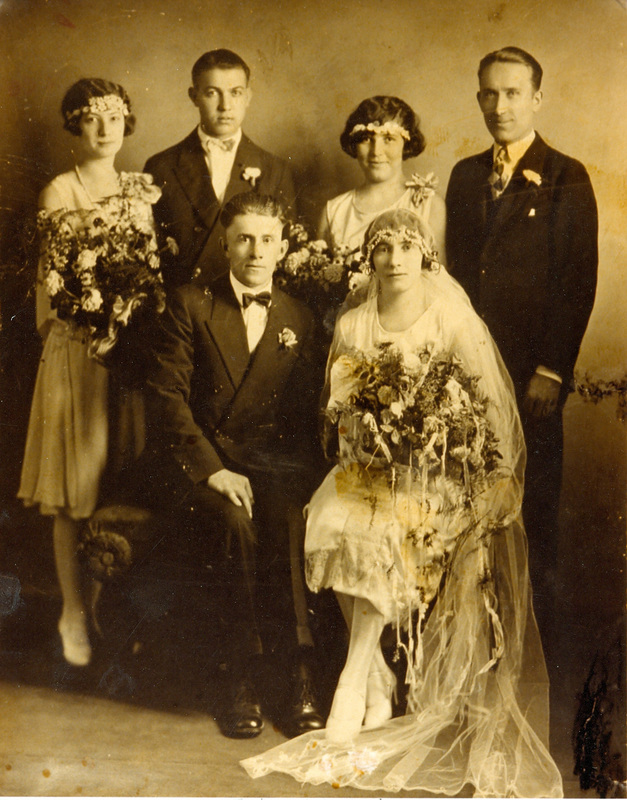 The wedding of Phillip and Lydia Knipple (née Brethauer) on October 2, 1926 in Portland. Back row from left to right: Beatrice (née Helzer) Brethauer and Samuel Brethauer, Rachel (née Brethauer) Shaffer and Jack Shaffer. Photograph courtesy of Jill Gaddis. ​This story was written by William H. Burbach of Milwaukie, Oregon in 1976 and is based on material furnished by Mrs. Elizabeth Burbach and Mrs. Catherine Rudolph (Reminiscence of early 1900's). The poem was furnished by Peter Koch.